After what happened four days ago at Herculis Meeting in Montecarlo, no one is able to exult over the new Italian record of 2.39m achieved by Gianmarco Tamberi, since at the third attempt of 2.41m, Gimbo was stretchered away from the stadium because of a strong pain in the ankle. The day after the accident, Gianmarco wrote on his Facebook profile: “Most likely, there is nothing to do… but, if there was even a remote chance, please, cross your fingers with me”. Unfortunately, despite the crossed fingers, there was nothing to do. The indoor world champion and european champion will not be on the track at Rio 2016 Olympics. After the first analysis, the doctor from Pavia who visited Gimbo, found a 50% lesion of the left ankle’s deltoid ligament, an accident that cannot be recovered in so few days and that will force the Italian athlete to skip the competition for which he has been training since years. 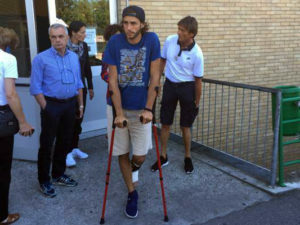 In fact, yesterday Gianmarco underwent the operation and, as declared by the doctor and his assistants, the surgery was a success but the athlete will be forced to two immobilisation weeks followed by two partial mobilisation weeks and four rehabilitation months.